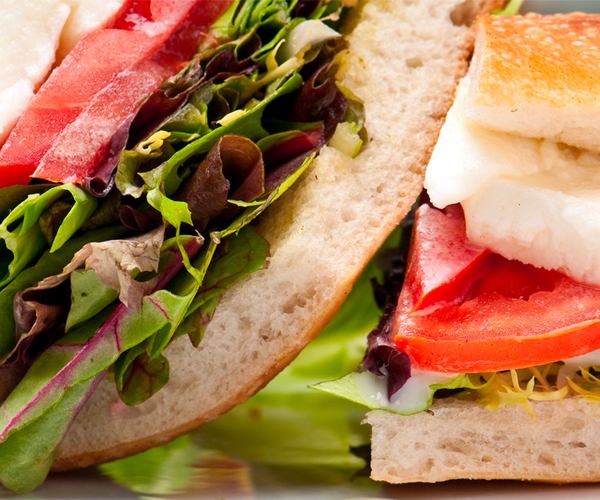 Salerno soft cheeses are fresh, with a high moisture content. 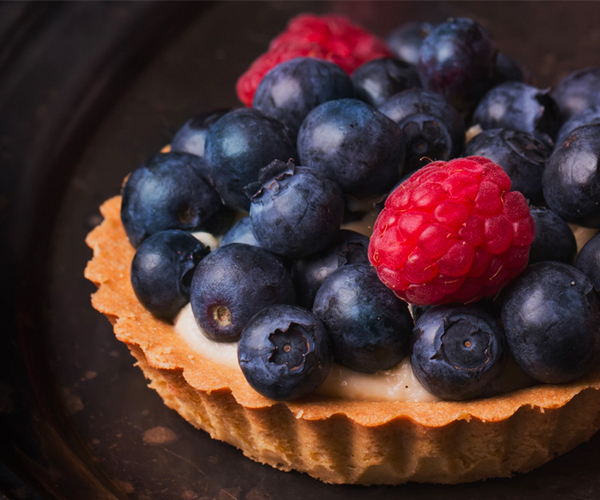 With a range of textures, our products can be used for a variety of meals from appetizers, salads, main courses or even dessert! Bocconcini, or “little bites”, is a semi-soft, rindless mozzarella cheese made from stretched curds. It is stored in a light brine to maintain its freshness. 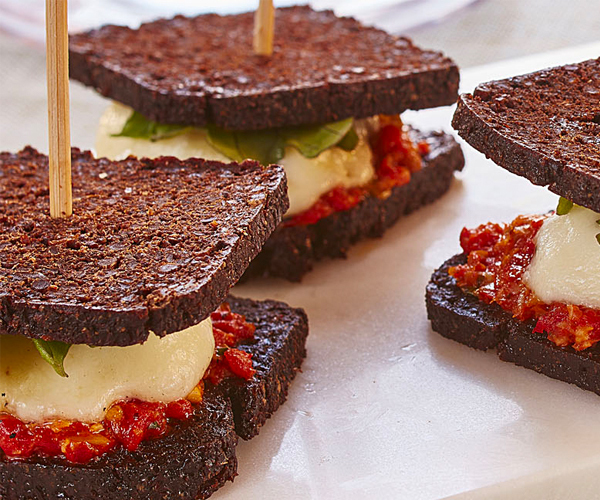 It is ideal as an antipasto, or before just about anything! Milk, bacterial culture, salt, microbial enzyme. Packaged in brine (water, sugar, calcium chloride, lactic acid). 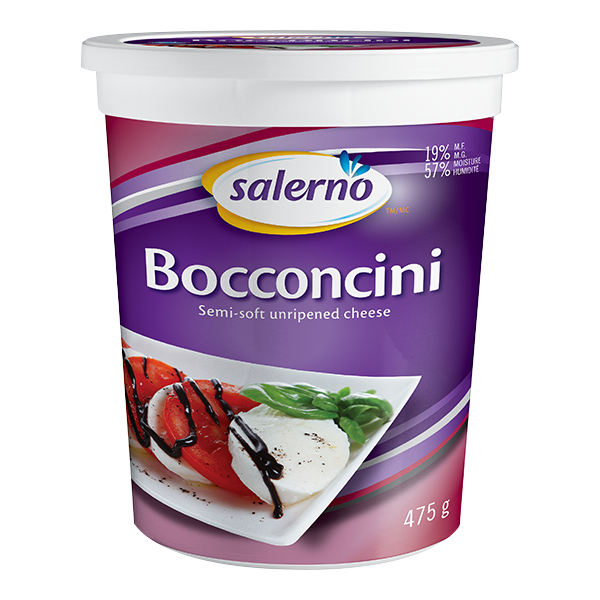 Salerno bocconcini is available in regular size (33 g). Also available in Cherry and Large. 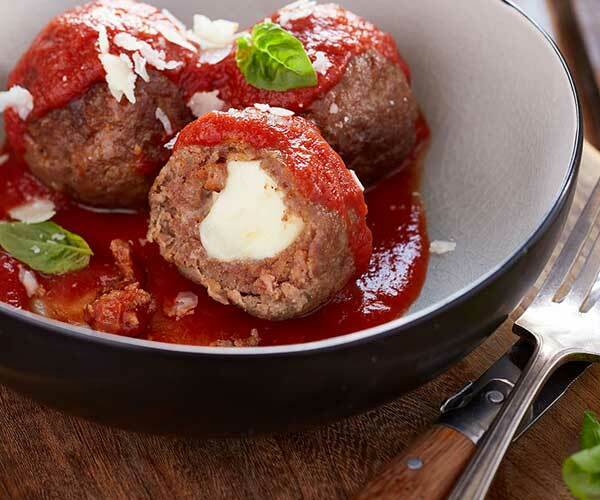 Bocconcini, or “little bites”, is a semi-soft, rindless mozzarella cheese made from stretched curds. It is stored in a light brine to maintain its freshness. 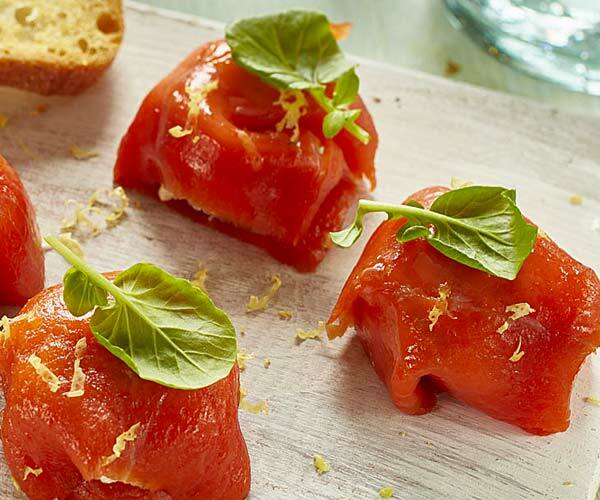 These are a bite-sized version of our traditional bocconcini cheese ̶ smooth, soft and sweet. 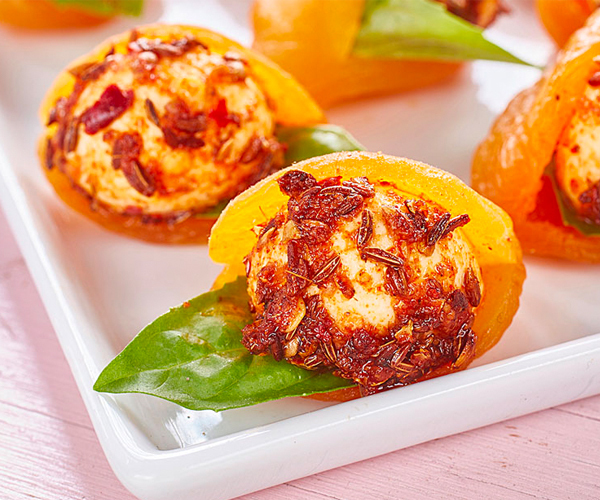 Perfect for appetizers or salad toppers! 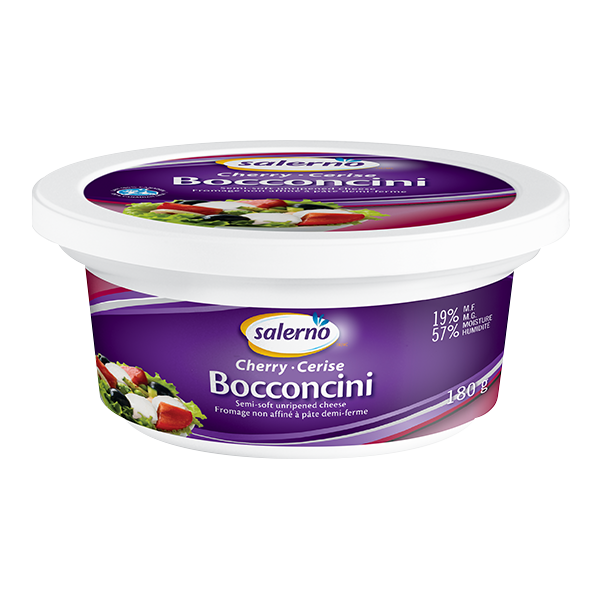 Salerno Cherry bocconcini is available in (10 g). Also available in Regular and Large sizes. 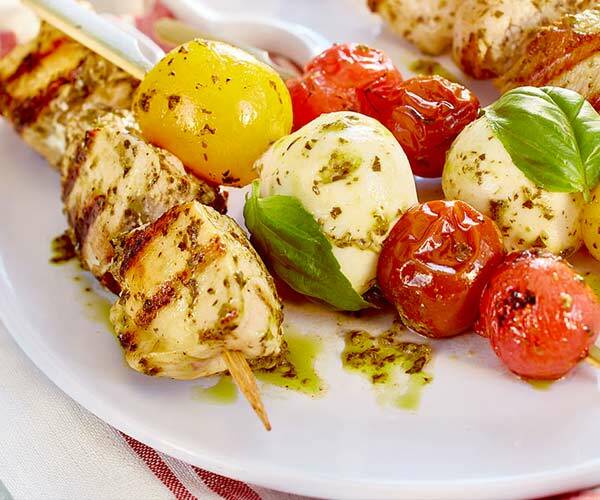 This bocconcini is large enough to slice, making it perfect for caprese salads. 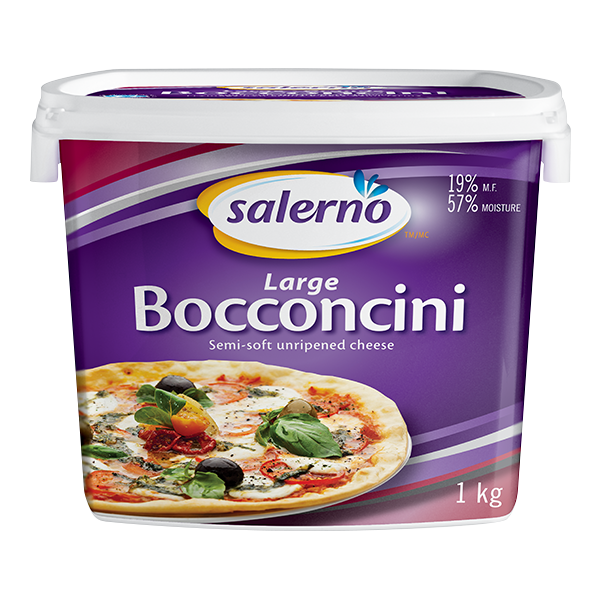 Salerno large bocconcini is available in (100 g). Also available in Regular and Cherry. 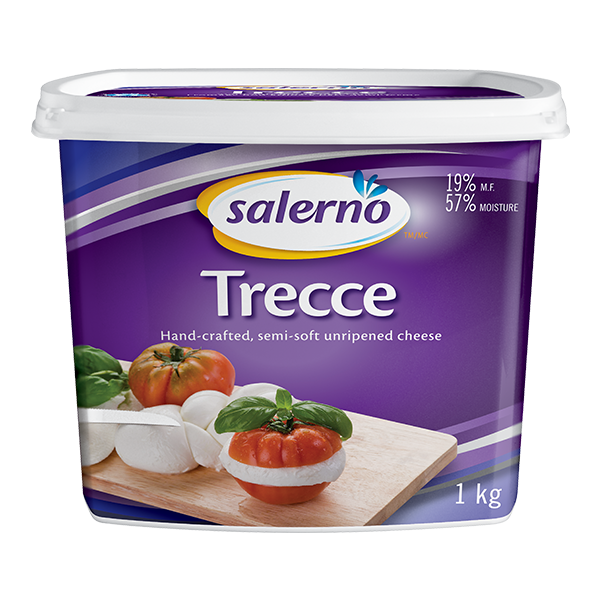 Trecce is similar to bocconcini in that it is made from stretched curd and stored in light brine to maintain its mild and delicate flavour. Its thread-like curd is pulled and shaped into a braid. 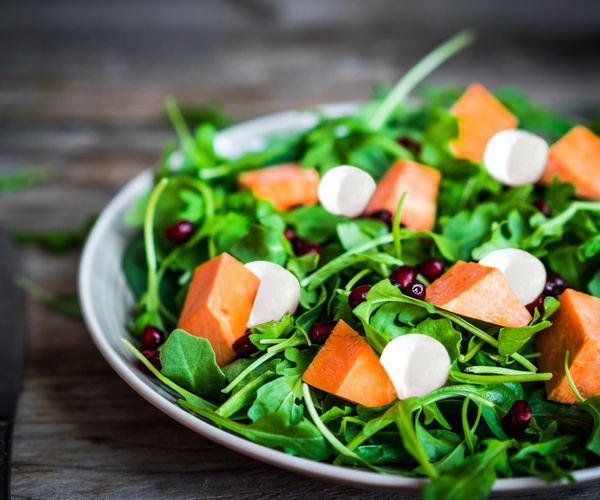 Trecce is the perfect cheese to accompany roasted vegetables, or just as perfect sprinkled with fresh herbs, and drizzled with olive oil and balsamic vinegar. 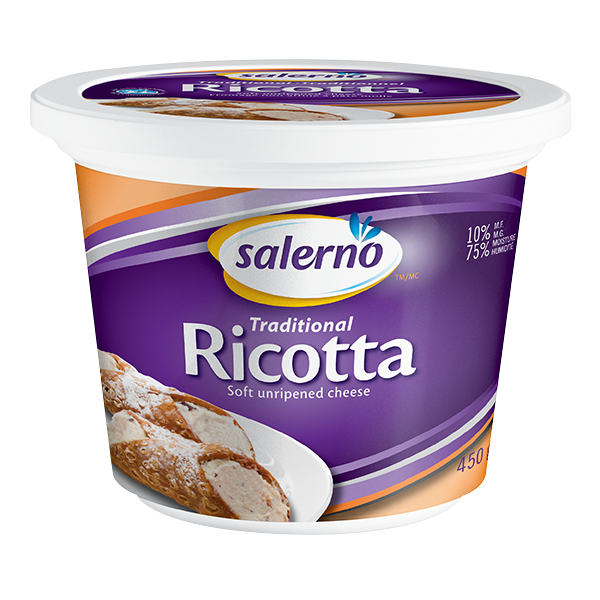 Ricotta is a fresh cheese made with whey and milk, produced using traditional methods. 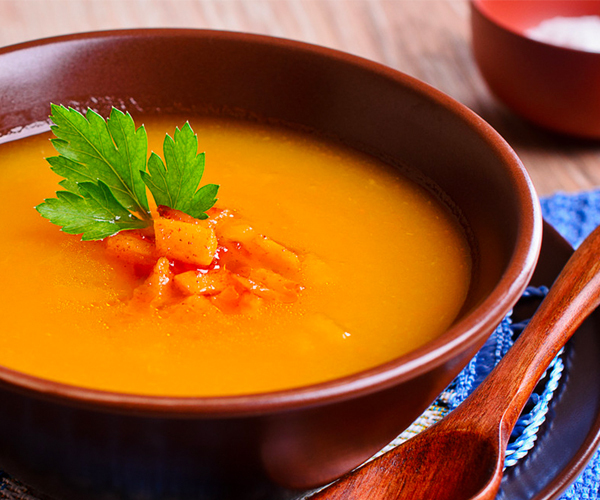 It has a smooth texture and is easy spread. 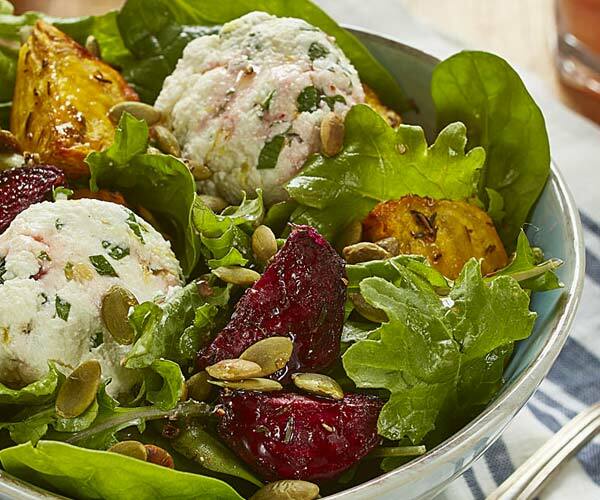 With a delicate, slightly salty taste, ricotta is predominately used as a filling for pastas and pastries, but is equally well-suited for stuffing vegetables. 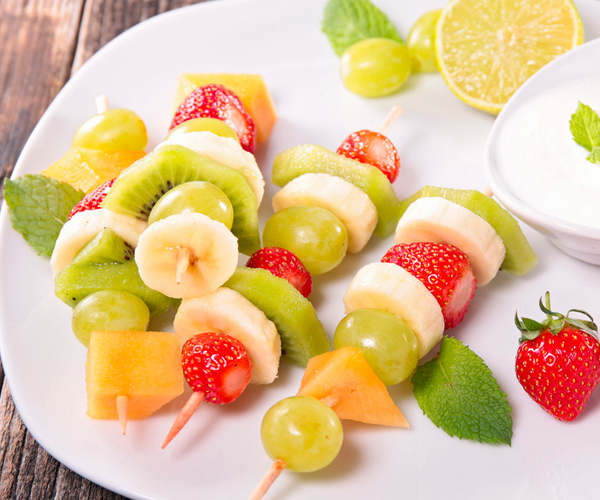 For an ideal breakfast or light dessert, combine it with fresh fruit. Whey, milk, whey protein concentrate, cream, salt, citric acid. 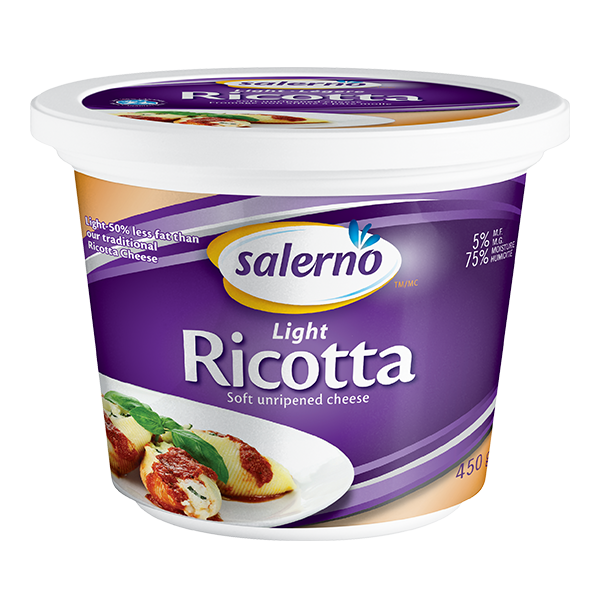 Light ricotta is made in the same tradition as our regular ricotta, but has more than 50% less fat than the original. 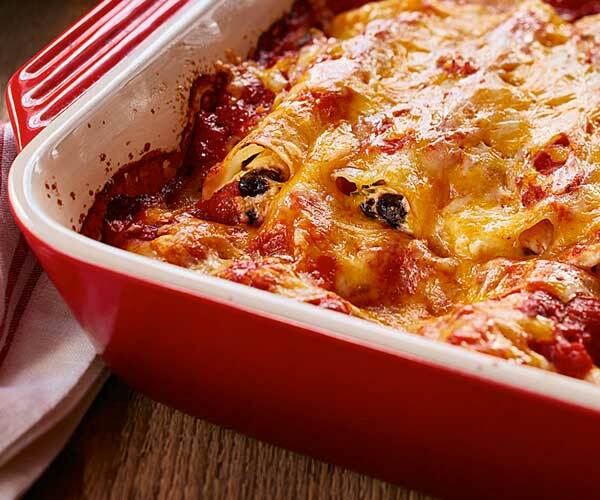 It is mainly used as filling in pasta and pastries, but can also be used as a spread. 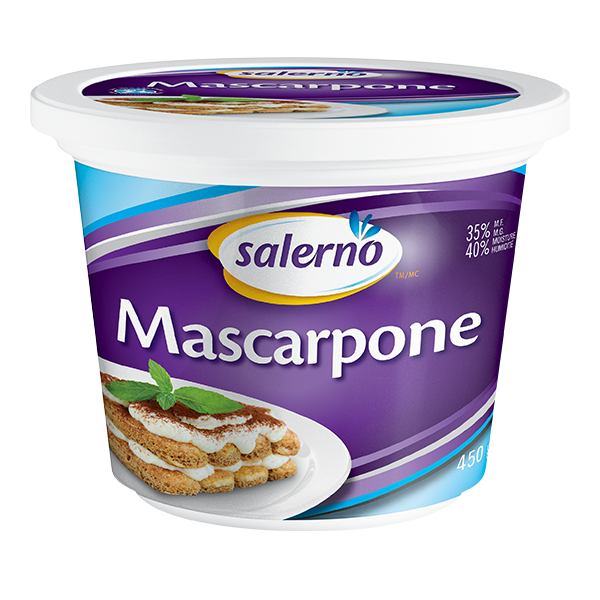 Made with cream instead of milk, Salerno mascarpone is renowned for its rich, yet fresh taste. Buttery and sweet, this cheese is smooth and easy to spread, and has a moist and creamy appearance. 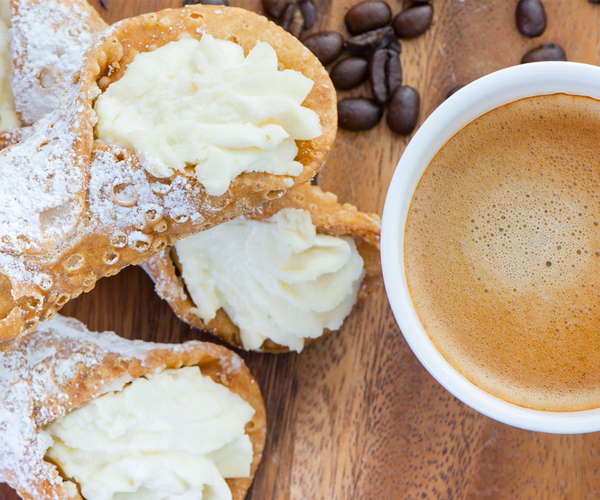 It is truly a delectable addition to desserts and pasta sauces. 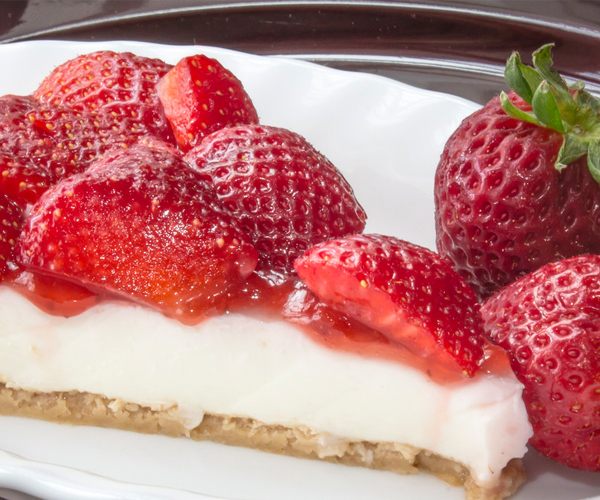 Mascarpone works just as well in place of whipped cream, especially as a topping on fresh fruit. 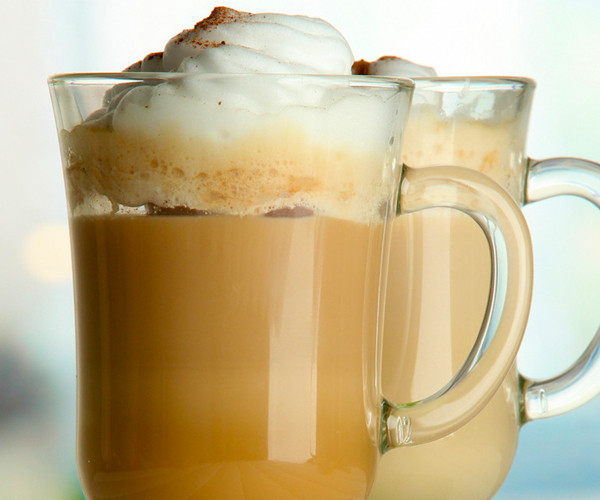 Cream, milk, skim milk powder, citric acid, locust bean gum, carrageenan.